When summer is produce is at it’s peak, a salad pretty much makes itself. Add in some avocado and nothing else matters. As I mentioned in my previous salad post, any produce works, especially in season gems like tomato & white peaches. While it looks simple, the flavor is anything but. 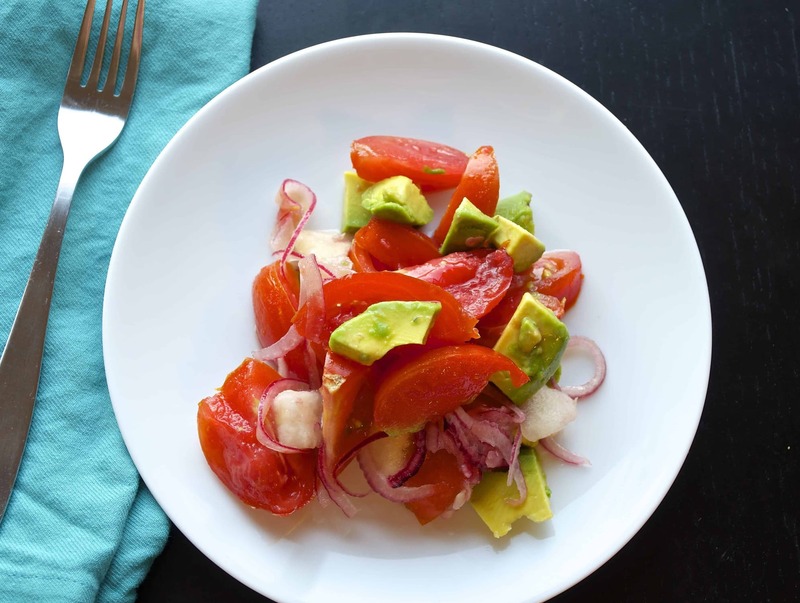 Juicy tomatoes, sweet white peaches & buttery avocado meet spicy red onion and a bright lemon vinaigrette. Make 20 minutes or so ahead of time so the flavors have time to come together. While it’s delicious packed for lunch, I especially love it for a simple weeknight dinner. A crispy baguette, fresh boiled-corn, rose’… meet me on the porch. 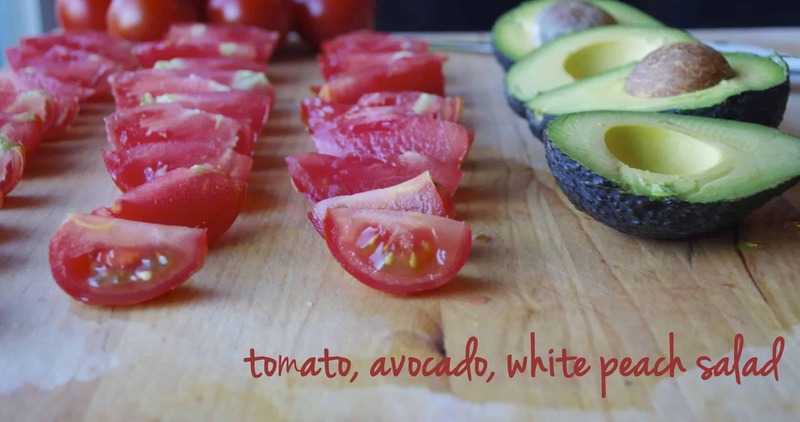 Avocado, White Peach and Tomato Salad! Use fresh, ripe produce and this salad pretty much makes itself! Toss together the red onion and red wine vinegar and let sit while you chop the rest of the ingredients, about 15 minutes. Drain the onions and pat dry. Toss onions with tomato, peaches, lemon juice, olive oil, and pinch salt pepper. Let sit for 5 minutes to absorb the flavors. To serve, add 1/2 of the salad to each plate and top with chopped avocado. I received free samples of California Avocado mentioned in this post. By posting this recipe I am entering a recipe contest sponsored by California Avocado and am eligible to win prizes associated with the contest. I was not compensated for my time. First… Alex I just want to say how much I love the direction your photos are taking 🙂 Great work!! Next… hello, match made in heaven. A “fruit” salad of some of the best vegetables-that-are-really-fruits. Love it! I would love if you could share what resources you used to improve your photos.. I am new to food photography and looking to improve!! I have to agree with Regan – your site graphics and your photos are looking mighty fine these days 🙂 And digging your salad series -this looks so fresh and delicious 🙂 Have a great weekend, my friend! This sounds like a very refreshing salad for these hot summer days. So simple. I will have to do this. It’d be great to bring to work. Thanks for the post! Beautiful salad! Your pictures are convincing! Beautiful photos! This dish makes me think “summer”. woah!!! this looks so refreshing and perfect for summer! Don’t you love it when the fruits and veggies are the stars of the show? Great combination of fresh summer flavors going on here! !